Dad deeply loved the work and spirit of each and every one of his artists, Talent and Passion were all that mattered to him. More than anything he showed me the importance of artists as contributors to a civilised society. (…) Being an art dealer is not about selling things. It's about somehow acquiring a bunch of things that are worth considering. Raymond Hughes opened his first enterprise, Gallery 1 Eleven in 1969 at the age of 23 in Brisbane with virtually no capital but boundless enthusiasm and conviction. (…) Brisbane was not a cultural backwater as many would have you believe, the great Johnson gallery was one of the most impressive institutions nationwide. He quickly befriended many artists, and the Czech Émigré Rudy Komon MBE an art dealer renowned for his wide taste in art (and wine), who soon became his mentor in Sydney. Hughes relocated to New South Wales city in 1988, travelling extensively in China, Africa, Europe, USA, and Indonesia. Hughes developed his legendary passion for international and national artists, including obscure or outsider artists. Evan continues; Ray always saw real painting. He saw it though its line; he could weigh the mettle of a painter through their drawings. William Robinson’s majestic, whimsical line, Keith Looby’s obsessive exact touch, Davida Allan’s aggressive heroic screaming strokes, Joe Furlonger’s fluid poetic soft touch with ink. There is little wonder that in Ray’s glory years, the 1980s and 1990s his stable won five out of eleven Archibald Prizes plus a Moët and Chandon art prize, little wonder why in that same period he took twenty Australian artists to a Venice Biennale. Not once, but twice. It was during this period, that Ray Hughes acquired fervidly British artworks both for his gallery and his own collection. An avid collector of naïve paintings, Hughes acquired the works of Alfred Wallis (1855-1942), the Cornish fisherman turned artist, who was still then very much underrated, from the London Modern dealers he often visited, mostly from Mercury Gallery and Waddington Galleries. “Ray helped people look at things”, said Evan in a 2015 interview before 90 works from their collection was put into auction. 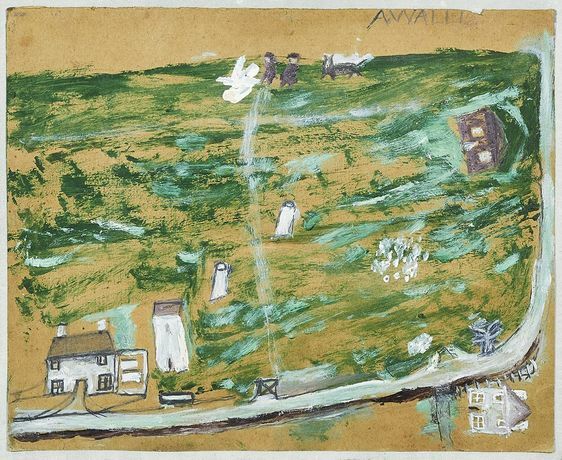 However, these exquisite works by Wallis acquired by Ray had been kept for his personal enjoyment, and now The Mayor Gallery is honoured to present this group of 9 artworks by Alfred Wallis to be offered for the first time in twenty years at The British Art Fair. The collection of the Late Ray Hughes will also include drawings by Roger Hilton CBE, prints by Sir Howard Hodgkin CH CBE, Allen Jones RA and Alan Green amongst others.